The Ion Age Blog: Rewards Programme upgraded and expanded! When we began The Ion Age we had a dream of a unique miniature universe and while we have been building towards that for two and a half years we have gathered many hundreds of regular customers. These customers, as all customers do upon their first order, signed up to the Rewards Programme when they opened a personal account with us. Every order with us earns Reward Points and those points can be used to get discounts or free items in or on future orders with us. The Rewards Programme has remained the same since we began...until now! We have upgraded the programme and expanded it. Here are the details. The first thing to say is that the value of each point you have or will earn is UNCHANGED so there is no alteration in what you have earned. We will not short change you, not now, not ever. The second thing is that all of the existing rewards have now been removed and replaced as of 3th November 2015. There are five new levels of rewards and they range from the use of 300 Points up to 9000 Points. Three levels of customer discount applicable to all orders and used before leaving the cart. Two levels of free product that will be added to your order and shipped at our expense to you worldwide. Use of this code on your order will take 300 points from your account total and on screen reduce your product total for the order, of any size, by 10%. This is done prior to the addition of the flat shipping charge and if you qualify for free shipping this will still be applied. Use of this code on your order will take 900 points from your account total and on screen reduce your product total for the order, of any size, by 15%. This is done prior to the addition of the flat shipping charge and if you qualify for free shipping this will still be applied. Use of this code on your order will take 1800 points from your account total and on screen reduce your product total for the order, of any size, by 20%. This is done prior to the addition of the flat shipping charge and if you qualify for free shipping this will still be applied. 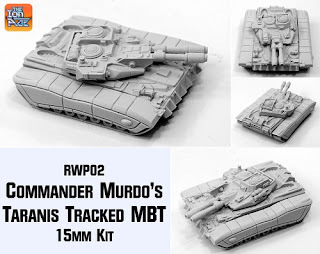 Use of this code on your order will take 2000 points from your account total on screen and add the unique Taranis Tracked Main Battle Tank worth 20.00GBP to your package. This is RWP02 Commander Murdo's Taranis Tank which is now on our website in the Rewards Programme page. It is a resin kit, a modified tank with a standard lower hull, left tracked propulsion units, right tracked propulsion unit plus and a unique upper hull and command turret (originally from IAF100B) and a white metal sponson gun. While this kit can be purchase as normal it can be had free for points! We will have an article on this kit during November. Go HERE. 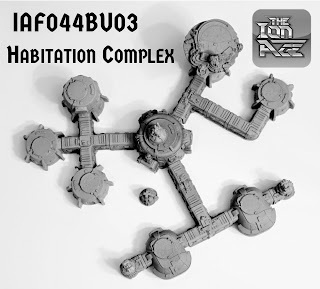 Use of this code on your order will take 9000 points from your account total on screen and add the IAF044BU03 Habitation Colony Bundle of 15mm resin terrain worth 125.00GBP to your package. This is an entire Habitation Colony with more than twenty pieces and it will provide enough structures for a standard table. You can see its exact contents HERE. While this bundle can be purchased as normal it can be had free for points! Its a big box but we will ship it for free anywhere in the world when you use your points to get it free. All of these new rewards are online now and you can see them when you log into your account with The Ion Age. We hope you enjoy them and we welcome feedback for customer long term and brand new too. Contact us on info@theionage.com. This is all very exciting and you should sign up for our regular email campaign (see top right of the Ion Age blog for the sign up form).